ForeFlight Mobile version 6.2.1 is now available for download on the App Store. 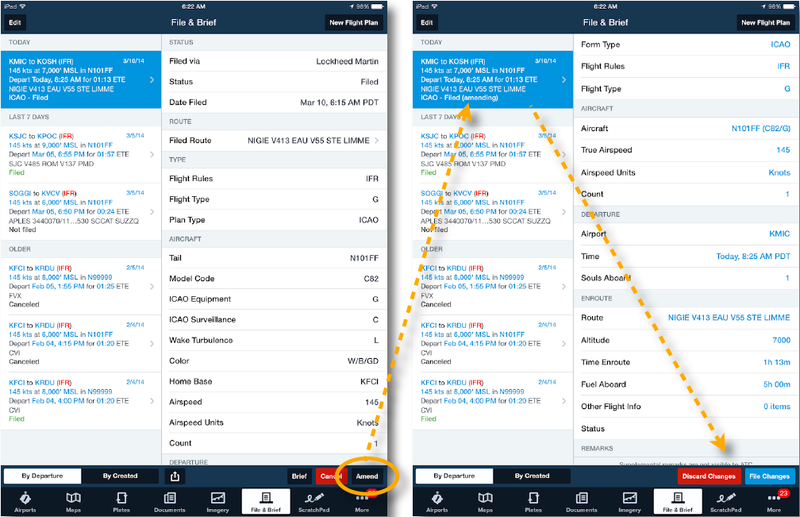 With ForeFlight Mobile version 6.2.1 we introduce Sync, a fast cloud-based syncing system that seamlessly transfers information between your iPhone and iPad. For example, this capability allows you to plan a flight on your iPhone and that flight will appear in the recent routes list on your iPad, or in your favorites list if you have marked the route as a favorite. There is no special user interaction required as syncing is automatic. Seamlessly sync your favorites and recents between devices. 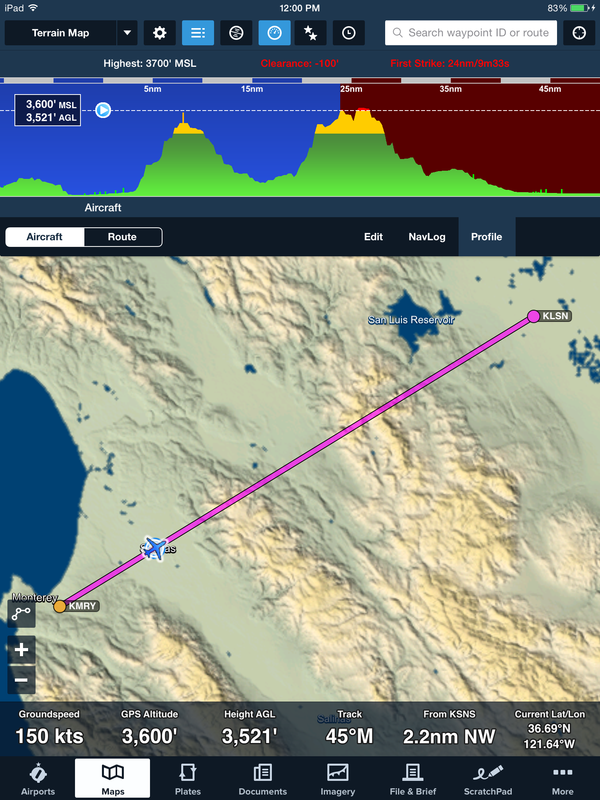 With this initial release, sync seamlessly synchronizes your recent and favorite: routes, airports, weather imagery, user waypoints, and recent procedures across all devices that share the same ForeFlight Mobile login. In the next release, we will add sync support for aircraft profiles and flight plans, with more sync-enabled features to follow. Because sync stores recents and favorites to the cloud, changes made on one device will automatically be delivered to the other device when it next connects to the Internet. In addition, if you are setting up a new device or need to reinstall the app your activity is protected and restored automatically. You can manage sync in More > Settings > then scroll to Preferences > Synchronize User Data. The toggle will turn Sync ON (blue) or OFF for that device. Sync has an ON/OFF switch in the Settings menu. A note for multi-pilot accounts: sync is disabled by default for multi-pilot accounts with a shared single login. 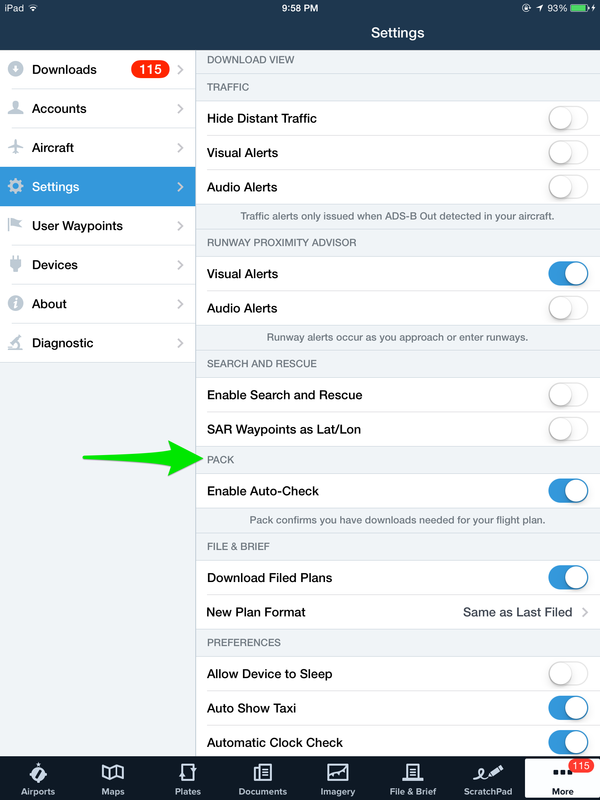 Sync is available with version 6.2.1 on all ForeFlight Mobile Standard, Pro, and Military service levels. Stay tuned! More to come with sync. The Profile view has a new refined look with the highest point, clearance, and first strike figures now presented in a panel on the right-hand side of the view, making that information easier to read. 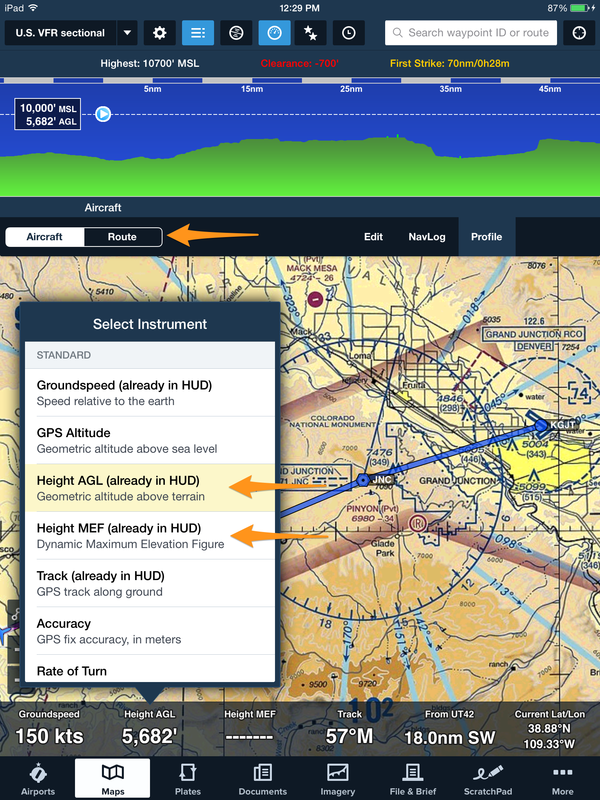 In addition, to best suit each flight Profile now gives you the ability to set hazard altitude and route width parameters for filtering terrain and obstacle alerts. The new Profile layout is easier to read and adds additional capability to filter terrain and obstacle alerts. Tap on the cog symbol to reveal the new terrain and obstacle settings menu. Select your desired Corridor Width, or route buffer, to display terrain and obstacle alert coloring only within the chosen corridor along your planned flight path. The corridor width options are: ½, 1, 2, 4, 6, 8, and 20 nautical miles. In this example, 2 nautical miles will alert you to terrain and obstacles one nautical mile to the left and one nautical mile to the right of your planned flight path. The hazard altitude setting gives you flexibility in choosing what relative altitudes from your aircraft are used for presenting the yellow and red alert coloring of terrain and obstacles. In this example, selecting Heli-Medium will color hazards yellow within 200’ vertical of the aircraft and red at or less than 25’. The Hazard Altitude setting is reflected in both the Profile view and the Maps Hazard Advisor layer. This is beneficial for low-altitude flight operations, like helicopters, by giving you options to fly closer to terrain or obstacles before the yellow and red hazard alerting appears. Toggle between route and aircraft mode while inflight. 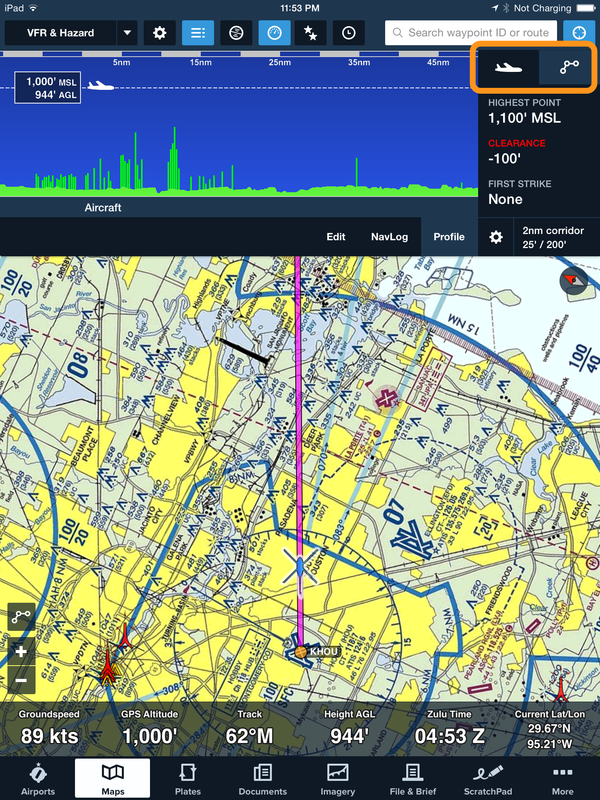 Profile view is a ForeFlight Mobile Pro feature. Our refinement theme continues in the Annotations feature with a refreshed menu bar. The buttons now have higher contrast making them easier to see. Shown here is a comparison of the previous versus current Annotation toolbar. 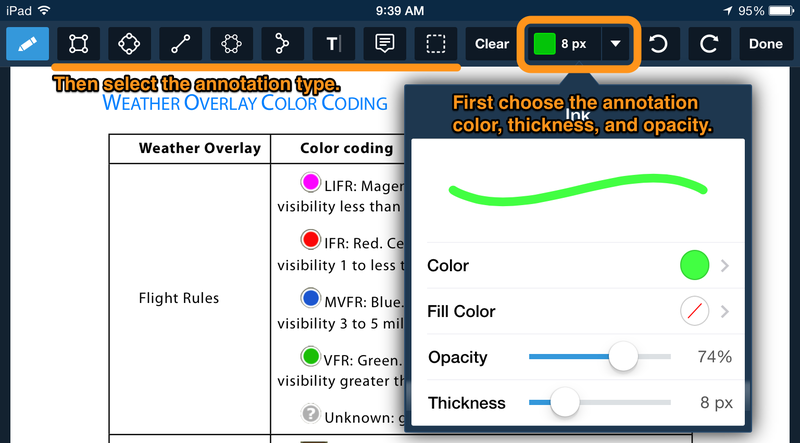 Access the annotations toolbar in either the Plates view or Documents view by tapping on the pencil in the upper right. A tip for using annotations, select your annotation color, thickness, and opacity settings, then select the text or shape option. A tip for using annotations is to choose your color, then select the annotation type. 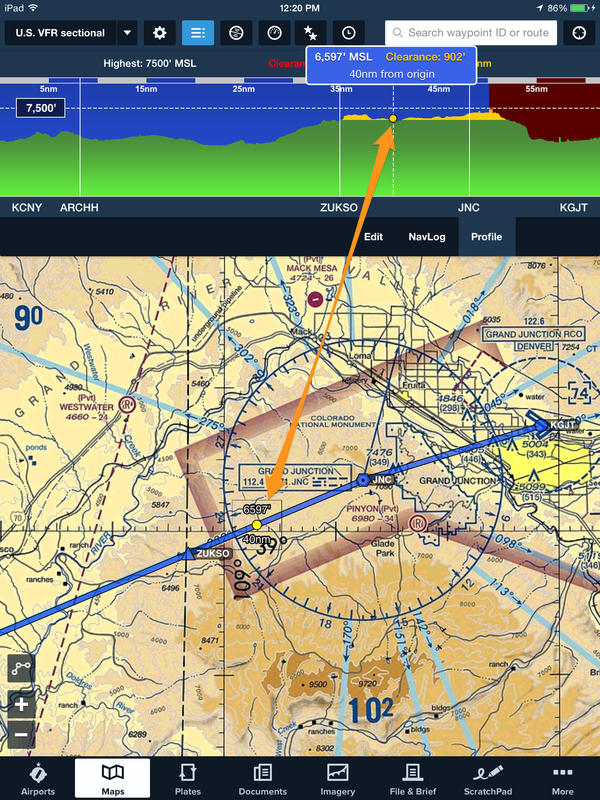 Annotations is a ForeFlight Mobile Pro feature. ForeFlight Mobile version 6.2.1 is a free download for subscribers via the App Store. Click here for instructions on how to update the app. 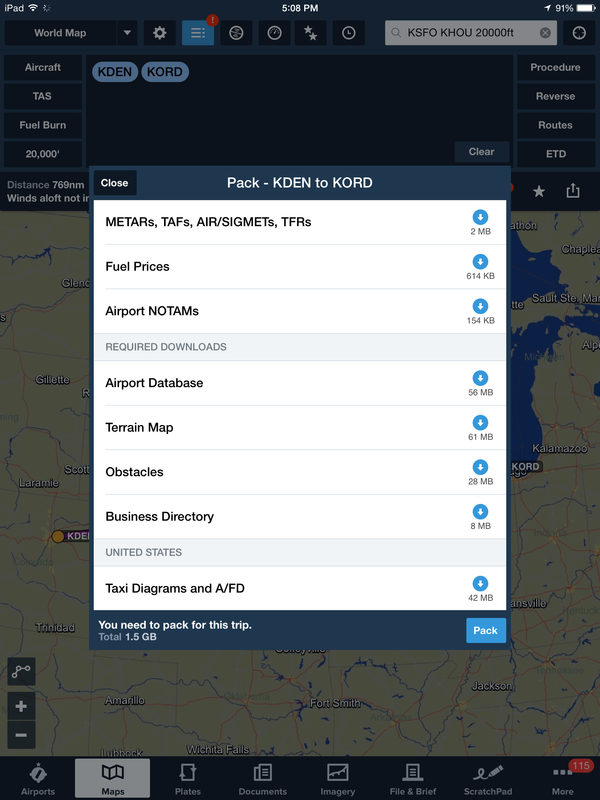 Amend your ICAO flight plan right in the app. Copy the new route from your expected route notification email to the iOS clipboard. Open ForeFlight to the File & Brief View and select the flight plan you wish to Amend. Tap Amend and paste the new route into the route field. Make any other modifications as needed, then tap File Changes. Now when you go to contact ATC, the amended flight plan is on file and you’ll be cleared as filed. Taking a few moments to amend your plan in-app before you even start the engine(s) is a lot easier and less stressful compared to quickly copying down a new clearance in the cockpit. 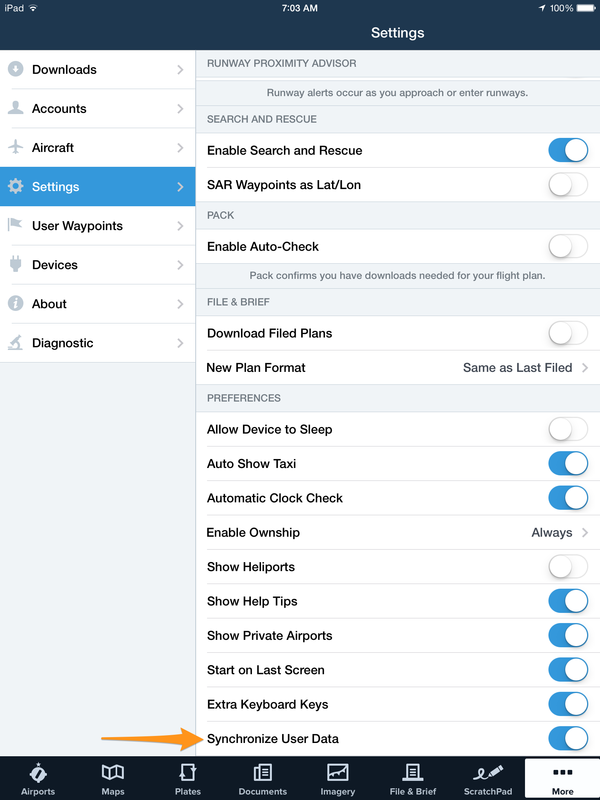 Amend is a new capability in ForeFlight Mobile 6.0 enabled by our integration with Lockheed Martin AFSS. 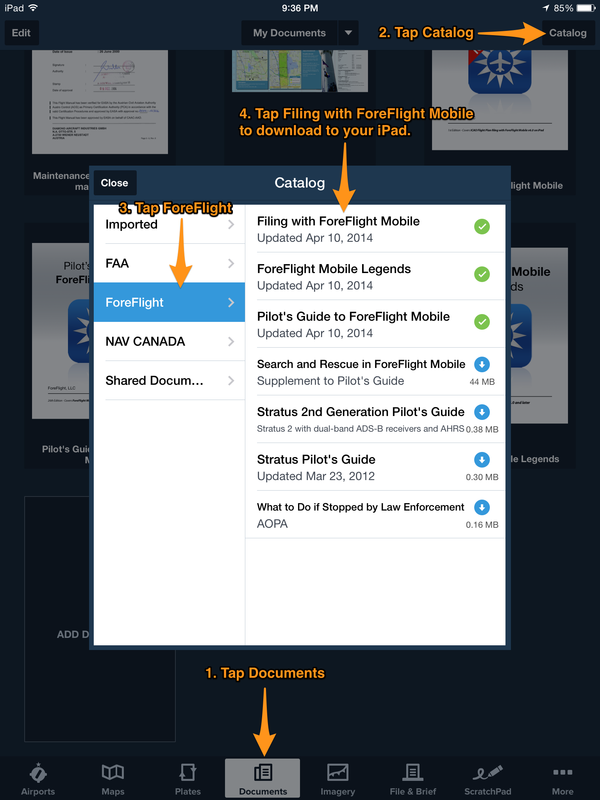 How to add Filing with ForeFlight Mobile to your Documents. 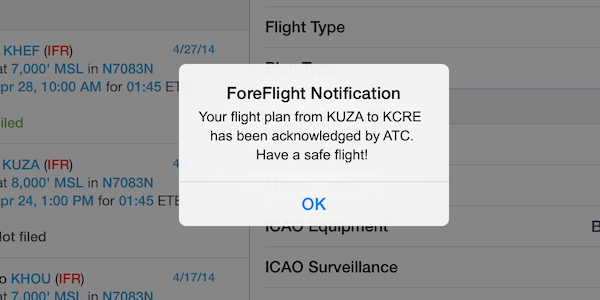 To use amend, your flight plan must be filed through ForeFlight Mobile using the ICAO format. 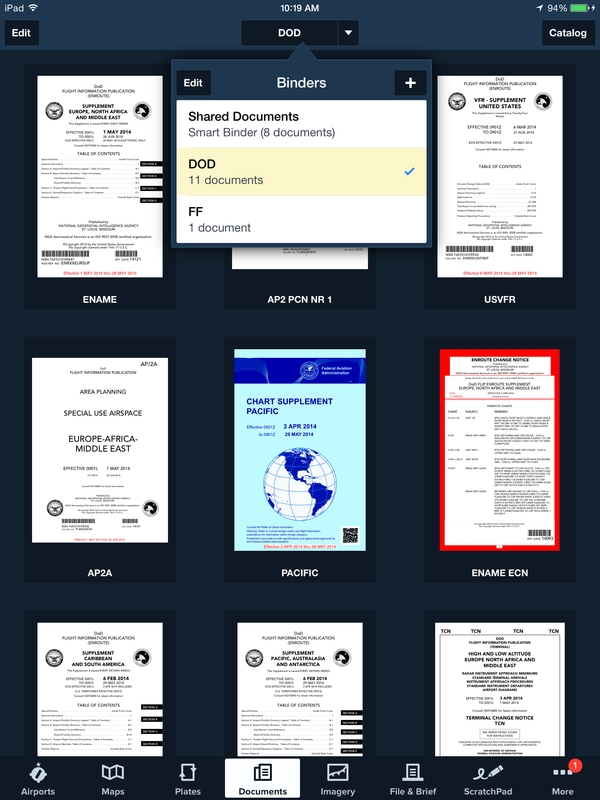 And to help with that, we have a new Filing with ForeFlight Mobile Guide available in the Documents catalog to guide you through every step to filing in the ICAO format. 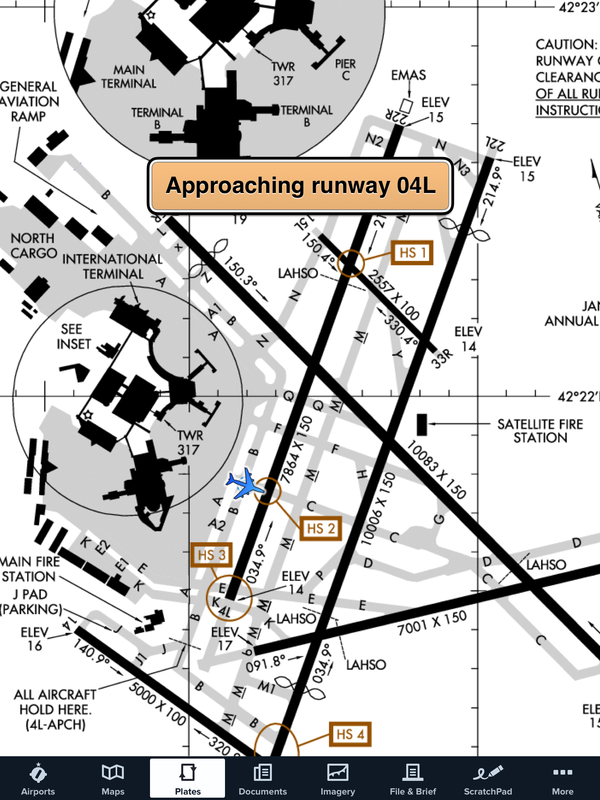 IFR/YFR flight plans can be amended or canceled up to 30 minutes before the filed estimated time of departure. VFR/ZFR flight plans can be amended or cancelled up to 2 hours after the filed estimated time of departure. The new Profile view takes our Hazard Advisor feature into vertical mode and gives you a side view of terrain and obstacles along your planned route. With dynamic color alerting you will know at a glance whether your selected altitude will keep you clear of terrain and obstacle hazards. In flight, Profile shows your current altitude in relation to obstacles or terrain ahead of your track. 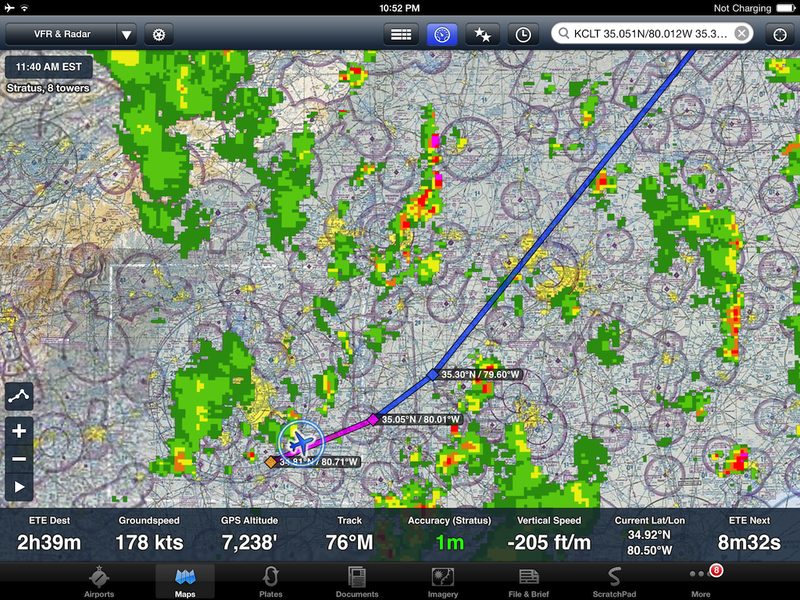 Profile is a ForeFlight Pro and iPad only feature. 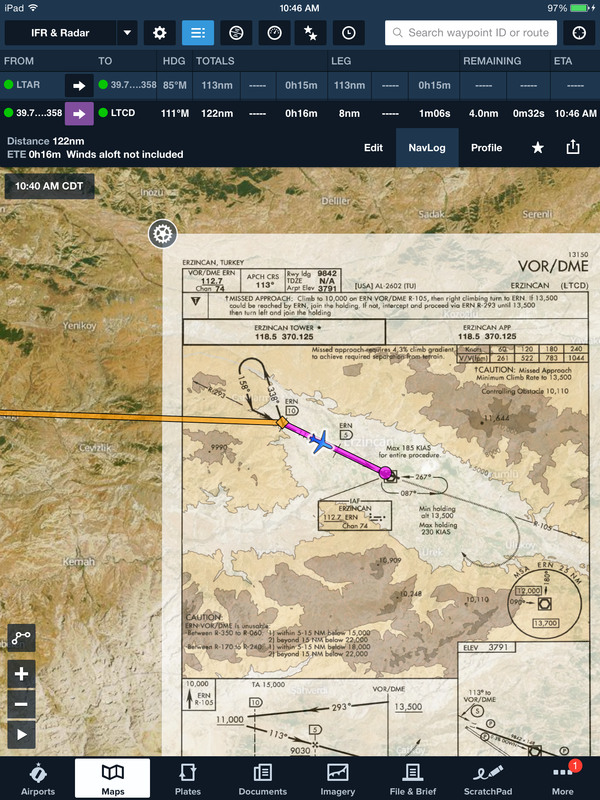 To use Profile for flight planning, begin by entering a departure and destination into the editor and tap the Profile button to view the vertical cross-section of your route. Tap and drag the altitude box up and down to adjust your altitude and you will see the dynamic interaction with obstacles and terrain. Highest is the height of the highest terrain or obstacle along your route. Clearance is the amount of vertical clearance you have over that highest terrain or obstacle along your route. First Strike is the distance in nautical miles from your origin or current position where your first impact with terrain or an obstacle would be based on your current planned altitude. 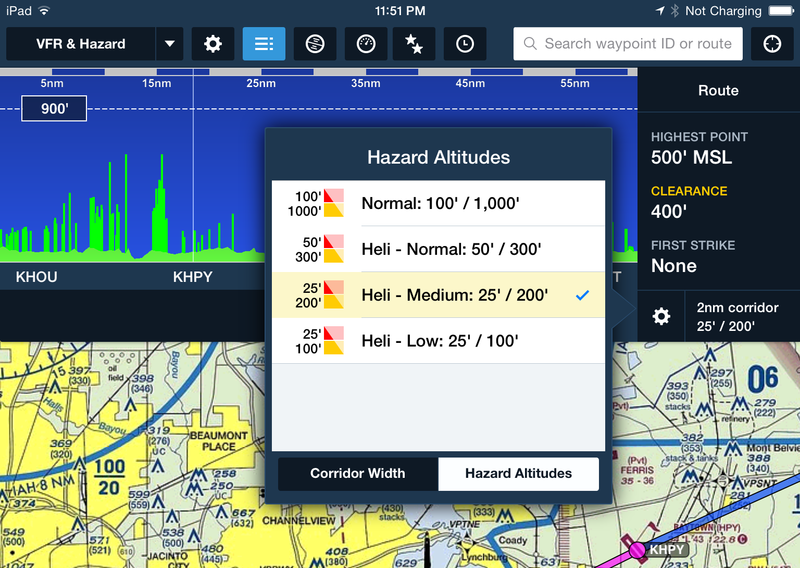 The text color (and terrain color) changes according to our standard hazard alerting feature: yellow for terrain or obstacle between 1000’ and 100’ below your aircraft and red for higher hazards. The middle band of the Profile is the graphical depiction of your route. The Profile automatically scales to show your entire route. You can zoom in and out with a two-finger pinch and spread gesture; pan by swiping left or right; drag the altitude box up and down to adjust the altitude. If your proposed altitude intersects an obstacle or terrain ahead, the sky area will change from blue to red at the point of first strike. To make planning easier, the altitude selected in Profile mode is reflected back in the Edit view. Routes within North America will display obstacles along your route depicted as thick vertical lines that change color based on your clearance height. Be sure to download obstacle and terrain data for offline use in the Download manager. Waypoints along your route are depicted as white vertical lines and the waypoint name appears along the bottom of the Profile view. You can also view the Profile of a ruler selection on the Maps view. Activate the ruler with a touch-hold gesture with two fingers on the Map. The Profile view will change to encompass just the area of the ruler. Tap away from the ruler to reset the Profile. Touch-hold with one finger in the Profile to display the clearance tool. Drag your finger across the profile to see your clearance at each point along the route. As you do that, notice that the “dot” progresses along your route line and its color changes to reflect the hazard clearance at that point. 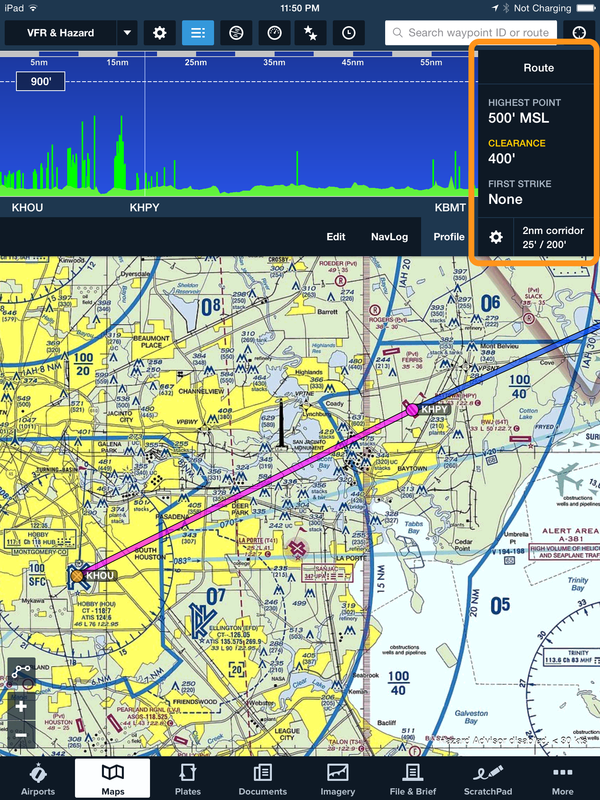 Aircraft mode abbreviates the Profile to display 50 nautical miles ahead on your track. Route mode displays your entire planned route. These modes are selectable via the Profile mode controller. In flight, the Aircraft mode continuously updates AGL and MSL values as you fly along. You will also see two new instruments in the HUD: Height AGL and Height MEF. Height MEF (or dynamic Maximum Elevation Figure) is similar to VFR MEF and tells you the height of the highest obstacle or terrain within a 0.5 degree box around your current position. Please note that Profile requires that you download obstacle and terrain data for offline use. 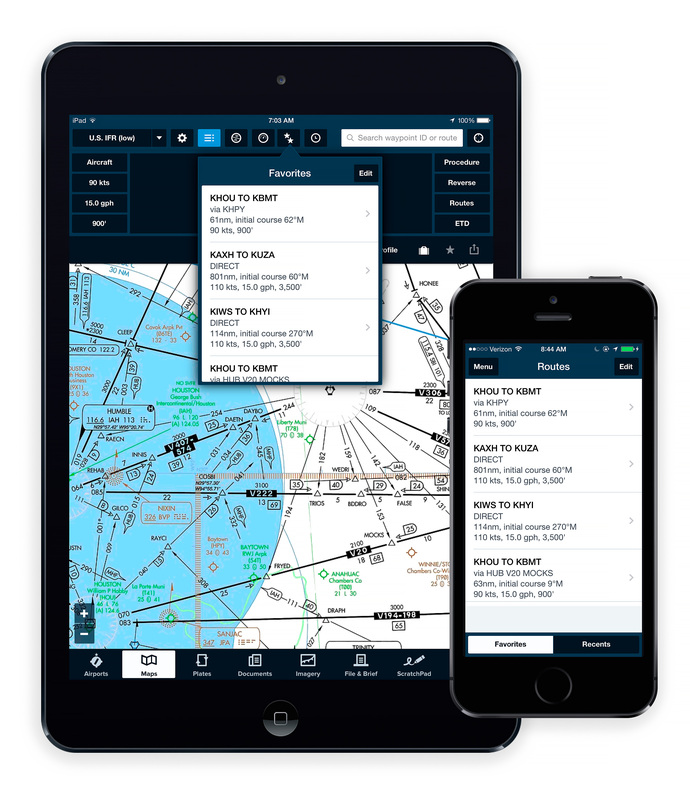 ForeFlight 6 builds on our integration with Lockheed Martin AFSS and we now offer you the ability to Activate and Close VFR flight plans, and Amend and Cancel both VFR and IFR flight plans, directly from the app. 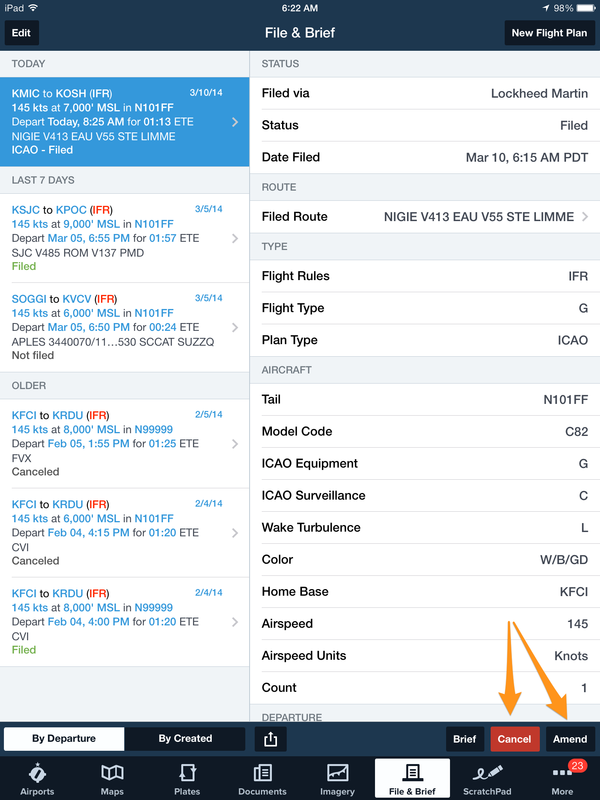 One tip for streamlining your workflow is to Amend your IFR flight plan based on the expected route clearance update you receive via Flight Alerts (a ForeFlight Pro feature). Refiling with your expected route will set you up to be cleared as filed when you contact ATC. That’s less stress in the cockpit compared to copying down a new clearance. Please note that amend, cancel, close, and activate via ForeFlight Mobile is not currently available with plans filed via DUATS. 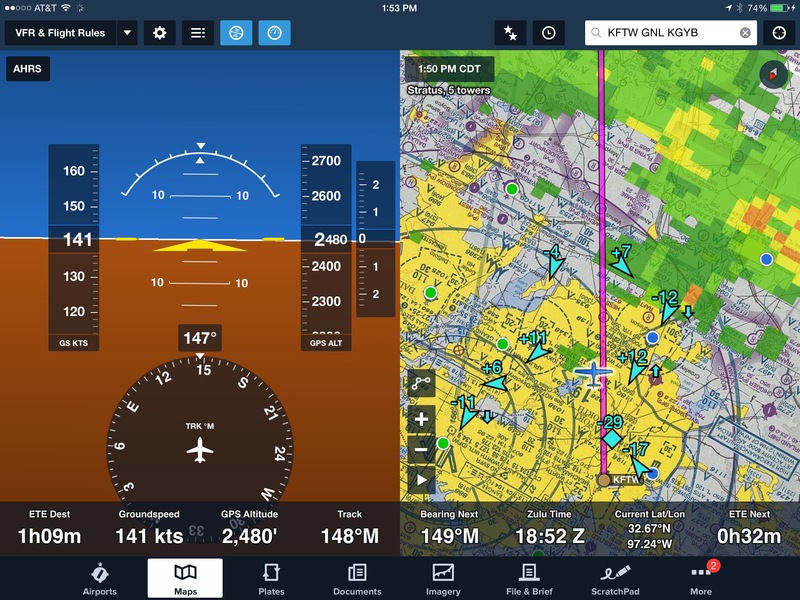 ForeFlight 6 also comes with a free firmware upgrade for the Stratus 2 which will enable two new features: a split screen attitude indicator view and Stratus Replay. Extending iPad battery life is an important consideration, and the biggest battery savers are turning off the screen and turning down the brightness. Stratus Replay can effectively double the battery life of your iPad by allowing you to turn off the screen between uses. 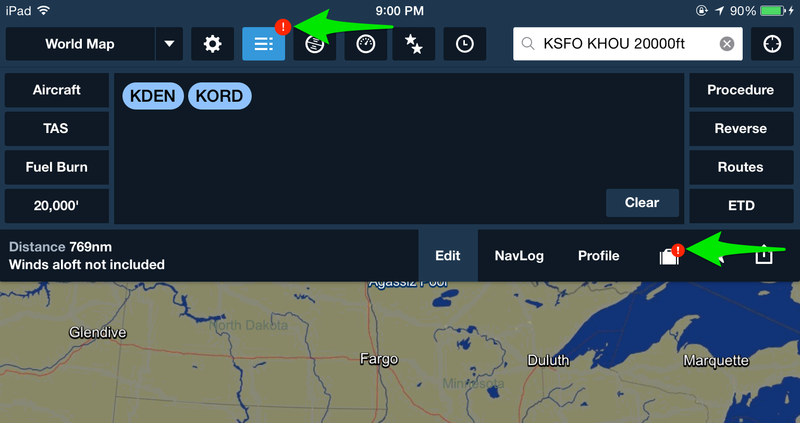 When the screen is turned on again, Stratus automatically sends ForeFlight any ADS-B weather that was missed, including radar, METARs, TAFs and PIREPs. This is helpful on a long cross country, offering 6+ hour battery life for your iPad and Stratus. Stratus Replay is only available on Stratus 2, however Animated ADS-B radar is available to both ForeFlight Standard and Pro subscribers and on Stratus 1 and 2. 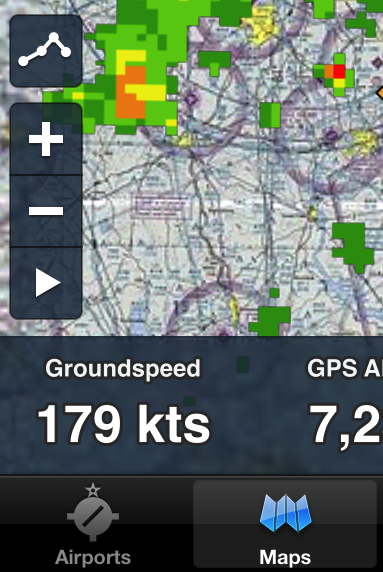 Also note that ADS-B weather (and Stratus) requires iPad 2 or newer or iPhone 4 or newer. Stratus’s built-in Attitude Heading Reference System (AHRS) drives the new split-screen attitude indicator view, providing backup attitude information to ForeFlight–complete with pitch, bank, ground speed, track and altitude. The attitude indicator updates multiple times per second so it moves smoothly, and it can be used in either portrait or landscape mode. While Stratus’s automatic AHRS calibration works in most cases, there are in app options for manual adjustment. With these features, you can now view ADS-B weather, traffic, moving map and attitude all on the same screen. 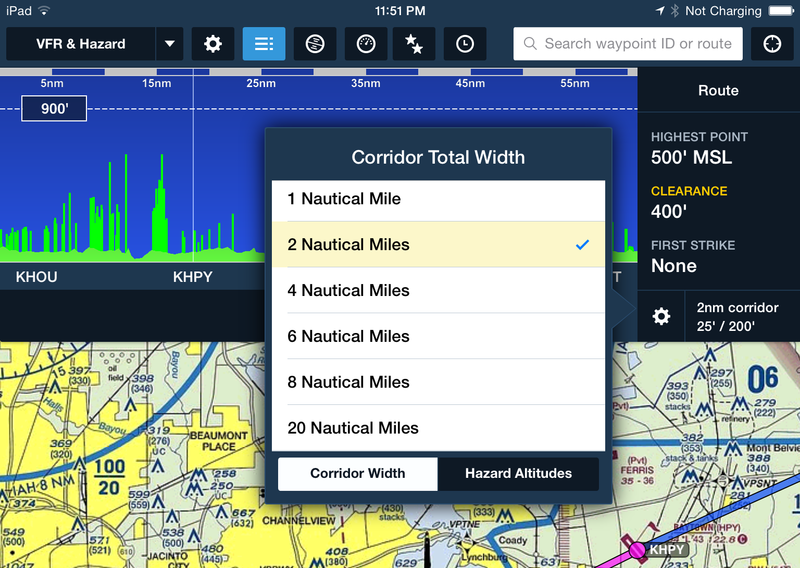 ForeFlight 6 is a free update from the App Store and is available to all current subscribers. Click here for instructions on updating to the latest version.